4.Support 7.5W fast charging for mobile phone,2W for apple watch. 6.Support charging two device at the same time. 5V/1A power supply, it will cause the watch is not charging or charging slower. 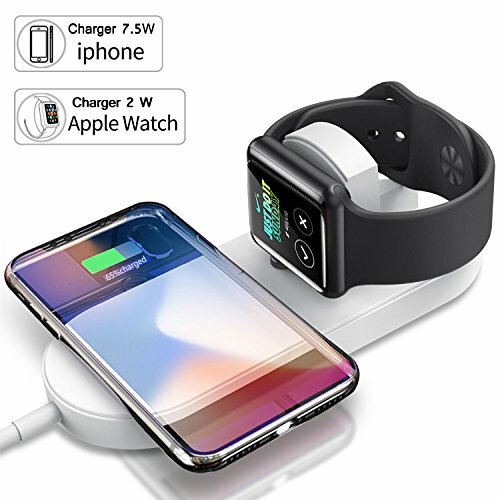 【Compatible Device】An Apple watch charger use for Apple Watch series 2/3 (Not for Apple Watch series 1); An iPhone wireless charging pad for iPhone 8/ 8Plus/ X; A Qi wireless charger For Samsung S7/S7 Edge/S8/S8 Plus/S9/S9 Plus/S6 Edge Plus/Note 5/Note 8 and other Qi-Enabled devices. 【Advanced Safety Protection】Exclusive multiProtect technology provides temperature control, surge protection, short-circuit prevention, over discharge protection to protect your charging devices. 【Package Included】1*Wireless Charging Pad with 3ft Micro USB cable（AC adapter NOT included), 1*User Manual,24-months warranty.if your wireless charger have any quality problem within 12 months, please kindly contact us free. If you have any questions about this product by NOIHK, contact us by completing and submitting the form below. If you are looking for a specif part number, please include it with your message.